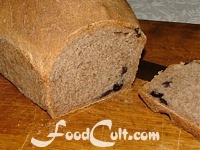 Home Made Breads, Buns &amp; Rolls - Free, Easy Recipes @ FoodCult.com - A Place for Galganov's Recipes and More - Food Matters! Make a softer, lighter loaf of bread with no obvious taste or color change while bolstering needed fiber (invisibly) in your wheat breads - Stir in 1/4 to 1/3 cup of wheat bran before you begin adding wheat. A special note about flour: North American flours are of the "hard wheat" variety. This makes them more suitable to yeast risen doughs. If you are in Europe (and even more so in Asia) use "bread flour" if you can get it. What ever you use, if it is not Canadian or American you will have to use more flour and, perhaps, beat it (after the initial addition of flour) a little more to stimulate the gluten. As a guideline - add flour until the dough no longer sticks to your hands. Warm water should be about 85ºF to 115ºF (29ºC to 46ºC). A pan of steaming hot water in the oven during the first bake stage helps keep the crust soft so it can push the top up in the initial baking stage. (It may also add a little sheen to the crust of some breads.) Water must be removed after about 10 to (no later than) 15 minutes for a nice crust to set. Place a pan of water on the lower shelf from begining preheat to the time you lower the heat and/or cover the baking loaf (usually up to, about, the first 15 minutes). Do not over-fill. You will have to remove that pan of hot water after the initial bake stage. Hot water is dangerous! Handle hot water with care. Substitute milk for 1/4 cup of water for a softer, smoother textured bread. Bread - The Staff of Life! We adore breads. It was many years ago we fell across a wonderful bread book and started baking. To this day we, as North Americans, enjoy some European style breads but more and more we enjoy home made breads ... and the more we bake the easier it gets. Now, when we run out of bread we just make another ... or, in a pinch, we'll make up some pitas - freezing any extra to use for instant pizzas. While the entire process for baking bread takes about three (3) hours, most of that time is given to rising and baking. The actual work is only about 3/4 hour including clean-up time. It does take a little longer at first but it's pretty quick once you've had some practice ... and there's nothing like a freshly baked bread. The other reason we do so much of our own baking is the ingredient choices. We choose to use organic flours, carefully selected oils such as sunflower or olive oil - depending upon the recipe ... and the addition of high value grains such as flax, sesame, oatmeal and other grains which may be high in essential oils, fiber, vitamins and other desirable dietry supplements. If you struggle a little in the beginning, don't become disheartened. It will get easier!